RLEK’s Training Handbook on Capacity Building on Women and Governance in South Asia:RLEK carried out a fact finding study and identifying the issues germane to women leadership in local governance in South Asia and published a book titled as “Women and Governance in South Asia: A Handbook on Capacity Building”.The handbook proved to be an invaluable tool for Master Trainers, Administrators, Training Institutions and Scholars involved in capacity building of women in governance. His ExcellencyPresident of Sri Lanka released the handbook. The efforts of RLEK have initiated policy changes at the national level. In December’2001 an all-woman team made a presentation to the Standing Committee of the Parliament for Rural and Urban Development comprising members of all political parties from both the Houses. The recommendations have been incorporated in the Committee’s 37th Report released in 2003 by the government of India. RLEK works to enhance the status of women in social, economic, and political spheres through a process, which aims at changing the nature and direction of the systemic forces that marginalize women and other disadvantaged groups. This implies fundamental redistribution of power between different groups. In this context, RLEK has conducted more than 500 camps which saw a participation of more than 50,000 beneficiaries specially women belonging to SC/ST communities from the three tier system of panchayats. The relentless efforts of advocacy and lobbying by RLEK has resulted in the passing of the Uttarakhand Panchayat Law (Amendment) Bill 2008 granting 50% reservation for women in panchayats. It is a historic achievement for the State. The 2008 Uttarakhand Panchayat elections witnessed 3378 victorious Elected Women Representatives out of a total of 5473 candidates. This figure highlights that more than 55% women have attained political participation in the institutions of local self governance, making it clear that people have unflinching faith in women’s political participation at the local level. RLEK regularly organizes Open Forum a macro-level intervention aimed at creating a pressure-lobby to influence legislation and public policy in sustaining women’s struggle towards effective decentralization of powers and strengthening the institution of local-self-governance. More than 800 EWRs (elected women representatives) with representation from other States like Uttarakhand, Himachal Pradesh and Haryana etc participate in this event. 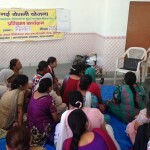 TheUNDP, India supported project titled “Community Empowerment for Sustainable Development”. Under this project RLEK christened the process of social mobilization “Prakriya” meaning a process-of change for the rural communities. As a result, RLEK formed around 280 SHGs, also formed federations in each of the districts of project implementation. In this context, it is noteworthy that few years back when the banks went on a strike for a week, these SHGs sustained on their own and also went on to provide small loans to the community household in need. Surprised by this self- sustaining character of the SHGs formed by RLEK, Thorat, the then Deputy Governor of the Reserve Bank of India (RBI) visited and interacted with the SHG groups formed by RLEK. Women are the most marginalized sections of society and schedule caste women are even more victimized due to their gender first and secondly their so called caste status. Women in the hills are the backbone of the society as they carry out household chores collecting firewood by venturing into deep forests. To put an end to this the organization has introduced the concept of community kitchen fueled by LPG cylinders in collaborations with the Hindustan Petroleum Corporation Ltd. (HPCL). This mitigated the use of the traditional hearth which was the cause of respiratory disorder among women. These community kitchens have proved quite successful in breaking caste discrimination as women from upper and lower castes both have access to the facility and they have to share the same space doing away with the centuries old practices of discrimination.